“Total $55 million is what Adams is alleged to have received. Some party chieftains claim it is $80 million,” a source aware of the contents of the report told SaharaReporters. 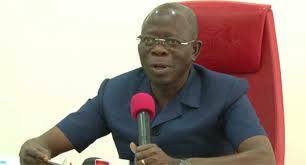 According to report, $17 million is what Oshiomhole allegedly received as bribe from Zamfara: $10 million for him, $7 million shared between Farouk Adamu, former Minority Leader of the House of Representatives; Niyi Adebayo, former Governor of Ekiti State. He received from other party chieftains, too.